L. Albert Hahn, a great economist in the decades after WWII wrote Common Sense Economics because he thought that most mainstream economics had drifted into fantasy land as a result of the rise of Keynesian economics. 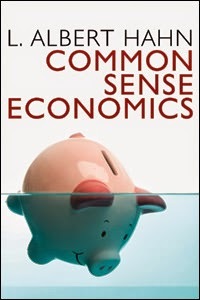 I like the cover picture that shows a piggy bank sinking under water, which is what conventional investment wisdom will cause. “As every experienced market operator knows, success on the stock market depends decisively on the ability to go against the prevailing tendency, i.e., against mass opinion, at the very moment when its correctness is least in doubt. The ability to go against the prevailing tendency, however, presupposes in the first instance that the individual remains conscious of the persuasive influence of mass opinion on his own opinion. This, in turn, presupposes a correct assessment of its force. Everyday observation shows the strength of mass opinion to be very great indeed. It engulfs not only those who easily succumb to foreign influences but even those with normally detached views and sober judgment. An almost superhuman effort is needed to evade the influence of mass opinion-particularly in the United States, where price movements and thus the opinions of others are continuously reported to the farthest corners of the country by the ticker. The ticker assembles, as it were, all the buyers and sellers in one room. The ticker influences speculation as the flag influences troops. As long as the flag is carried forward, every single man knows that the others still have the courage and strength to go on, and this knowledge sustains his own courage and strength. Once the flag retreats, every man concludes that the others' courage and strength is waning. As he knows that he cannot advance alone, he, too, retreats, even though he would not himself be forced to. It’s old, but still good advice for investors. The time to follow the crowd is the period after the bull market starts until just before it ends. The crowd won't get out of the market until long after they have lost close to half their nest egg. Most individual investors don't get into the market until it has reached close to its top. The market is near its top today so successful investors will start rebalancing into cash or gold, but those who do will get a lot of criticism from most other investors. Being a good investor means learning to enjoy solitude. From Common Sense Economics by L. Albert Hahn, London: Abelard-Schumann Ltd., 1956, 213-214.